Andre Washington, 17, was arrested on March 17, 2015 for shooting an innocent bystander in the face, police said. EAST HARLEM — A man parked at a Park Avenue red light just before rush hour was shot in the face by shrapnel from a teen's bullet, police said. The motorist, whose name was not released, was stopped at the light near 132nd Street and Park Avenue on March 17 about 4 p.m. when Andre Washington, 17, opened fire toward the street while chasing after his target, police said. One of the bullets ricocheted off a building and split into fragments, striking the driver in the nose, police said. The driver was taken to Harlem Hospital and the injury did not appear to be life-threatening, police said. After the shooting, an officer chased Washington into 2140 Madison Ave., in the Lincoln Houses, but lost him in the stairwell, according to the criminal complaint. Officers identified Washington on the building’s surveillance video and arrested him in his apartment that evening. 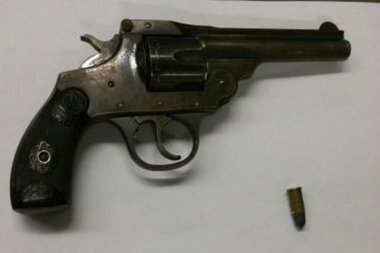 They also recovered a .32 caliber revolver, police said. He has been charged with attempted assault and criminal possession of a weapon. Judge set bail at $75,000 his next court date is April 23. His lawyer at Neighborhood Defender Services of Harlem was not immediately available. ►Police arrested a man for breaking into at least three cars at the BP Gas station on 125th Street and Third Avenue last week. Officers who were staking out the gas station arrested Taylor Clifton, 43, at 2 p.m. Tuesday. Clifton, who was trying to break into a car, told the officers, "Ok, you got me, I was just checking out the car," according to the NYPD. There have been several car break-ins at the gas station the last few weeks. Each robbery followed the same pattern — the suspect watches a customer fill up gas and approaches the unoccupied vehicle when the driver is paying at the counter, police said. In February, an EMT reported his wallet and a stethoscope stolen. Last week, a man who had just paid for the gas saw the suspect running away from his car, police said. The suspect in both robberies, which were captured on surveillance video, fits the same description as Clifton, police said. ►A drunk passenger stole a livery car and caused a three-car crash on the Triboro Bridge, police said. Emmanuel Gonzalez, 29, was in the back seat of a Lincoln Town Car about 11 p.m. on March 18 when the driver pulled over to pay the toll, police said. Gonzalez, whose license is suspended, got behind the wheel and drove onto the bridge, causing the crash that left at least one motorist injured, police said. Officers noticed Gonzalez had bloodshot eyes and smelled of alcohol, according to the criminal complaint. He refused to take an alcohol test. He was charged with unauthorized use of a vehicle, drunken driving, and driving on a suspended license. He was released on $2,000 bail Wednesday and is due in court on April 29, records show.